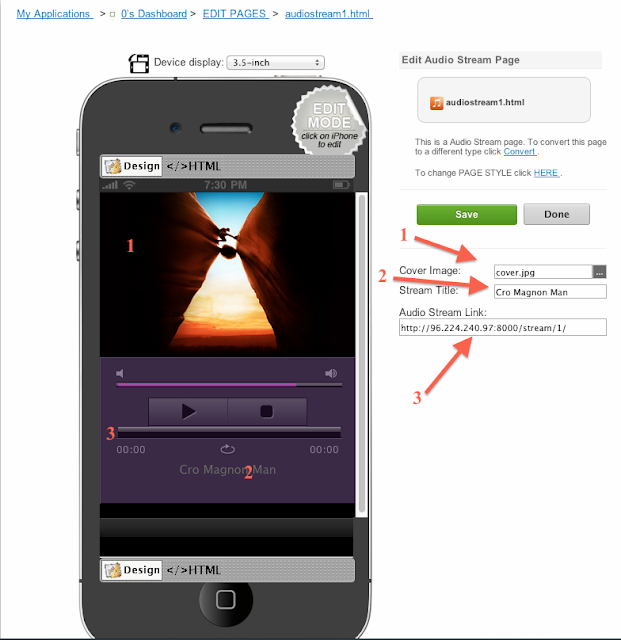 In this tutorial I will show you how to use the Audio Stream Page type. 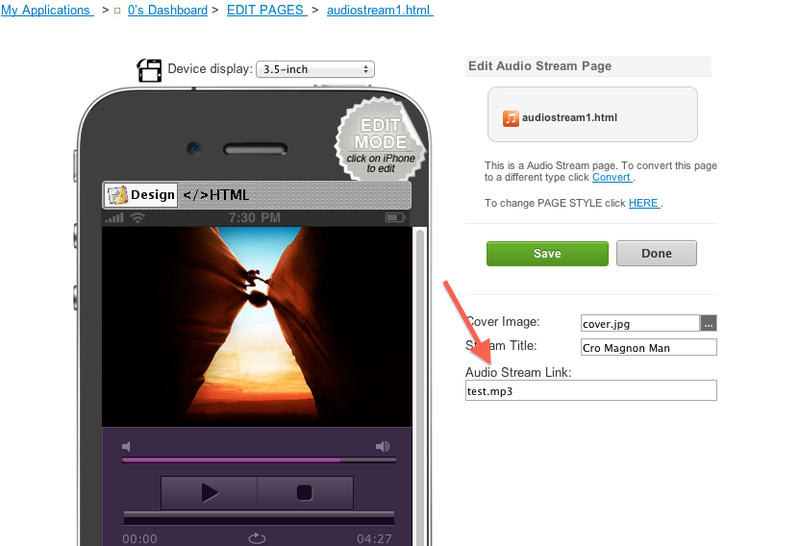 In order to add a new Audio Stream Page to your app, go to Edit Pages menu then click the "+" (Add New Page) button. From the list of the page types available select Audio Stream and click the "Create" button. 2) The stream title will appear on the bottom of the page. You can set any title. 3) Here you can set an Audio Stream link. The Audio Stream link can be any mp4 or mp3 file. 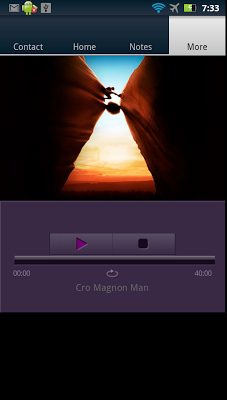 An example of a streaming link is http://www.jplayer.org/audio/m4a/TSP-01-Cro_magnon_man.m4a . Note that for iOS you can use also Radio Streaming links (e.g. http://96.224.240.97:8000/stream/1/) and direct links to media files uploaded in the Resource Manager of the App. So if you uploaded a media file in the Resource Manager (see the next screen image) you can set only the name of the file in this field. 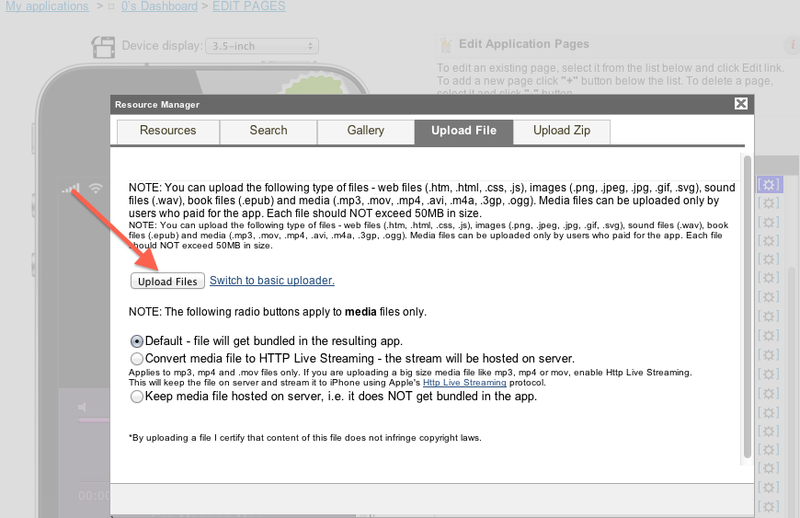 You may upload media files up to 25 MB size each. For iOS you can just set the name of the media file. This link format will work also for iOS platform. Note that on Android platform the Audio Stream page will always work in background mode even if you exited the app using the "back" button. how can you have the audio stop playing, when you leave the audio streaming page, automatically? This page type was specially created to work in background mode. But you can disable it during the submission process (last page). in my Android App and it work fine in the preview SC APP. But will it work on a android phone in flight mode whit no internet connection ??? The link point to SC server? and not directly on the file bundle in the native App ? http://seattleclouds.com/custom-url-schemes . The Background , xaudio and xvideo URL schemes will work in offline mode. But I need the repeat function on the audio track. How du I make a repeat function when I use background play ??? I have asked before and got an answer but never got it to work on android. Is there any way to adjust the jplayer skin? The purple does not go with my graphics. Any advice would be appreciated to be able to incorporate other already available jPlayer skins OR ways to at least change the color/font of the jplayer skin we have. Yes, you may change the skin. The skin for the jPlayer is a Jpeg image: http://seattleclouds.com/myapplications/Viteal/0011/jplayer.pink.fl... .Upload any other skin image with the same dimensions directly in the Resource Manager. is there a way that make the whole page ( cover AND player ) to stretch to use full screen for client device what ever the dimension they use ? anyway that we make the audio player page to use EXACT full screen for both ? and if so what cover pic dimensions will be the best ? You may use different CSS techniques to adjust the comer image for all screens. I would recommend to use a large resolution image (but not too heavy) and it will fit on most device screens. I think I have a related question on this - is it possible to embed the mp3 so that it plays whether an android is connected to the internet or not? If it is - how may this be done? You can do that with the Audio Play Page type. Then just set the name of the media file in the Edit Mode of the page. hye.. i want the audio stream function working offline.. how can i do that? Hi, How can I use my app for online radio streaming. Can anyone help. I have answered the ticket related you have opened. Please check on it. I have explained you step by step how to get and use a direct streaming URL. and uploaded the .css, the .jpg and the other two files seeking.gif and video.play into the resouce manager. Then I deleted the old Pink files. Now I realize I should just renamed those .css. .jpg files etc so they would be properly referenced. Is there a better way to go (can I edit the .js files to pick up the new skin files). Can you resend me the old pink files so I can re-upload (or at least give me the names so I can rename the blue monday ones with the old file names? At the moment there is no easier way but we will add one. The default files can be downloaded once you create a new Audio Stream page in another app. You can download the files from Resource Manager.